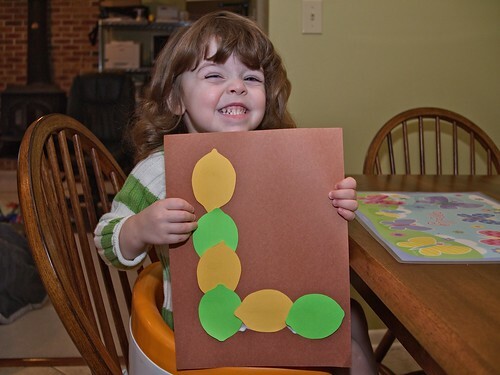 We started our letter L week learning about lemons and limes. Then we made fresh squeezed lemonade. As I squeezed the lemons, Molly had fun transferring the rinds back and forth. 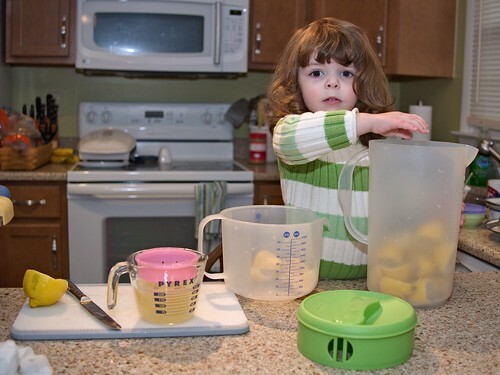 I tried to turn it into a counting lesson, but she was only interested in transferring and pouring. 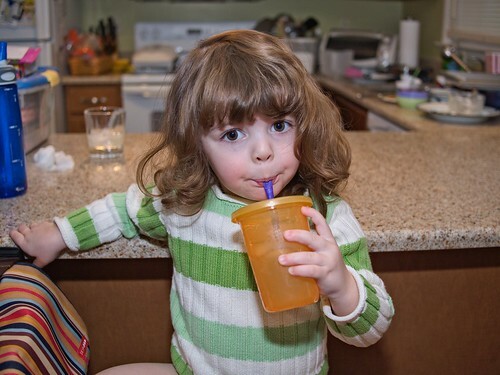 Molly loved her fresh squeezed lemonade. I realized that squeezing lemons by hand was harder than I thought it would be. Next time, I'll find a better way! 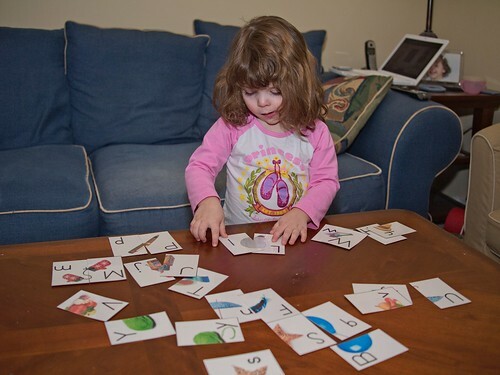 We started learning our lowercase letters with this matching game I found at Homeschool Creations. We worked on fine motor skills with these lacing activities. The beads kept her busy for over half an hour! 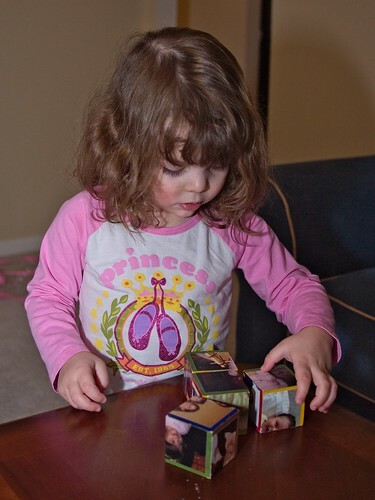 Molly got these picture puzzle blocks from her Aunt 'Chelle last Christmas and has finally learned how to match the puzzle on her own. 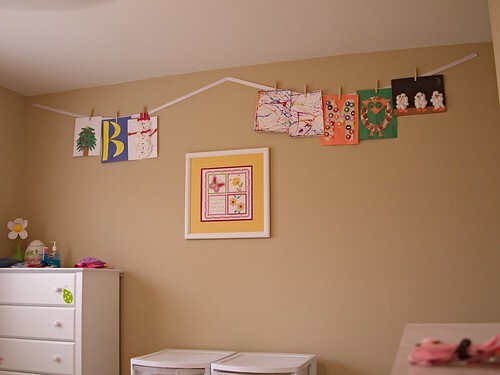 We needed a place to hang some of Molly's crafts, so this was my solution. I think I might need some more walls soon. 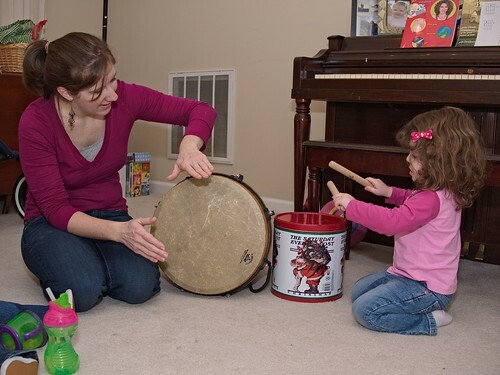 Our visit to the Long household was a very musical one. There was a lot of singing and dancing, and I'm glad to say that they've inspired us to add some singing to the bedtime routine. Here's a sampling of the music we experienced on our trip. I really don't like to fly, and I'll avoid it if at all possible. There is a lot of waiting, I feel like a sardine, and my ears don't handle it well (they sometimes don't pop for a day or two). I'm glad my kids appear to handle the flying experience better than I do. This video shows them having fun on our recent trip to Birmingham. 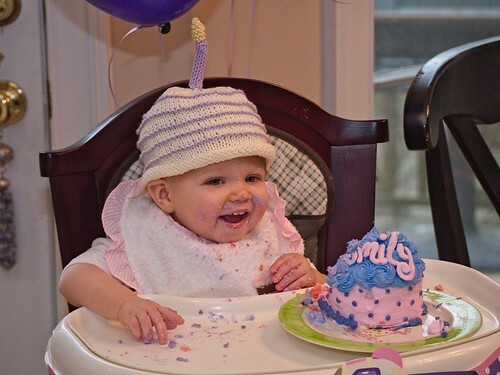 This past weekend we celebrated our niece's 1st birthday! We flew down to Birmingham for the occasion. Leah did really well on her first flights (as seen in this video). 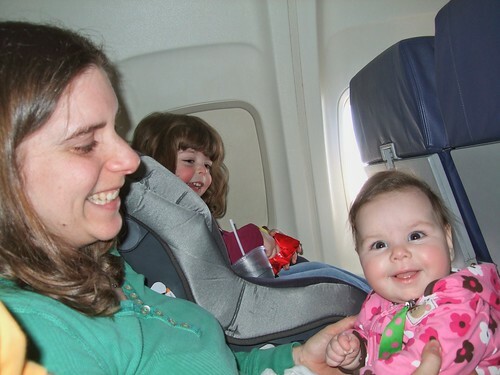 She slept on both flights and was generally happy when awake. 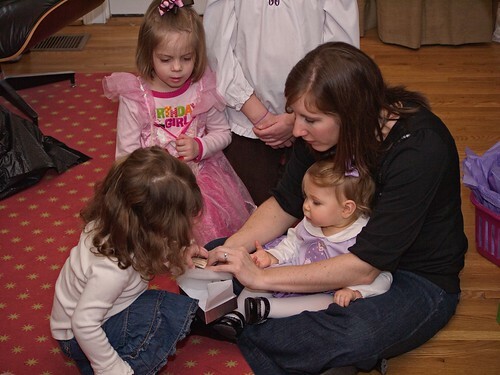 Emmie's birthday party was Saturday (though she didn't actully turn 1 until Sunday). Molly, of course, helped Emmie open her presents. Despite all the excitement, Leah was unphased. 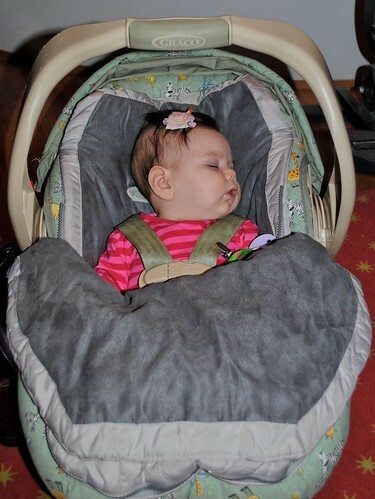 She slept for the first hour or so of the party. Opening presents took a long time, so Emmie took a break to hang out with me for a bit. Then it was time for cake! It took Emmie a couple minutes to warm up to it, but once she got going she realized how great it was. Leah did eventually wake up and join the party. 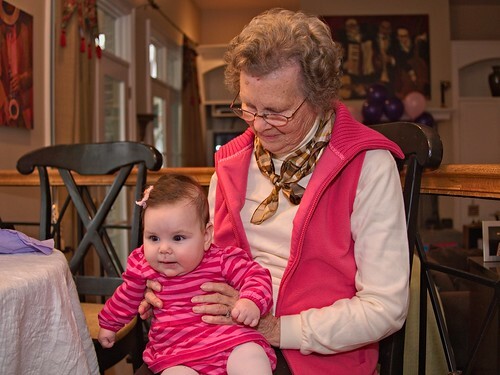 Here she is spending some time with her Great Grandmother Dot. 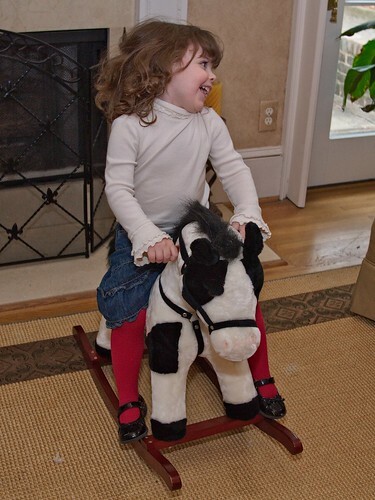 After the party, Molly got some late Christmas presents from her Great Aunt Roxanne, including this rocking horse that she really had fun with. I have a feeling it will be a big hit with our playgroup! 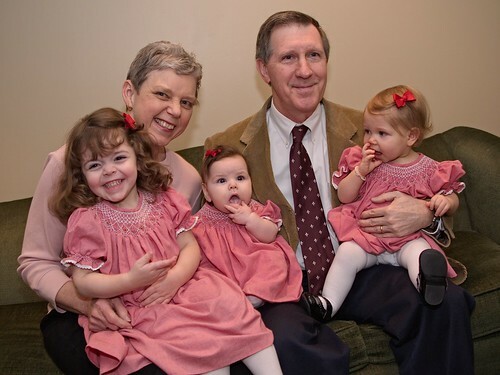 On Sunday, we were finally able to get a picture of all three girls wearing their dresses that G'Mom made them. There was a lot of music going on during our stay (as seen in this video), including piano, guitar, and these lovely percussionists. We had a great time visiting with lots of family. The girls did great the entire weekend, even sleeping in the same room! There are a lot more pictures from our trip here. Little sister, Leah, kicked off our 'O' week wearing her owl dress on Sunday. I found inspiration for our 'O' craft at No Time for Flash Cards. 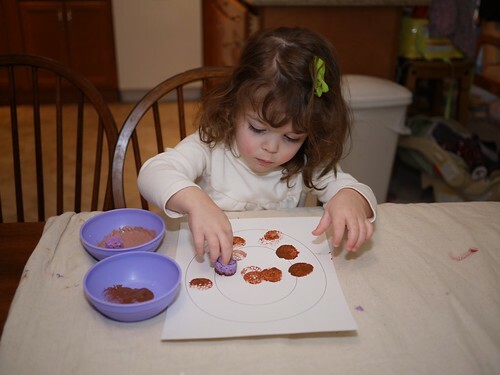 We began with some sponge painting. Then gluing on some shapes. And here you have it. 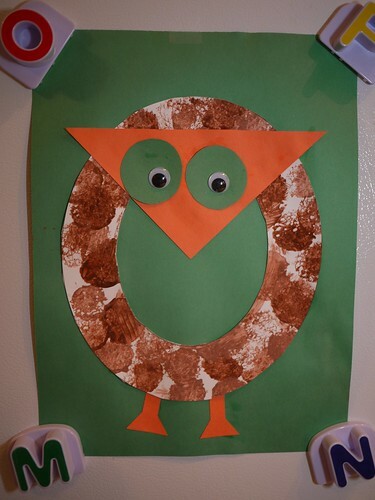 Whoo, whoo guessed we were making an owl? 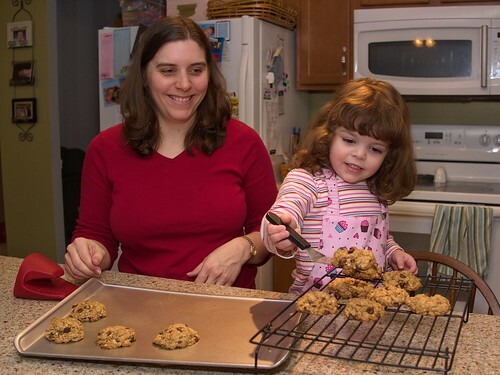 Continuing our 'O' activities, I helped Molly make Oatmeal Chocolate Chip cookies. She's been asking to help in the kitchen a lot lately. It's important to evenly space the dough when spooning it out onto the cookie sheet. We had to let them cool before digging in. 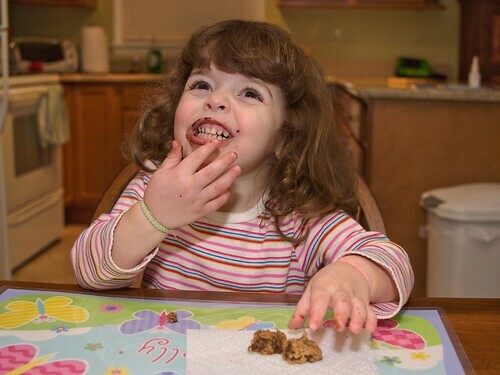 Molly thought the cookies were excellent, though I think she couldn't have eaten much chocolate since most of it is on her face. We finished out our 'O' week by participating in stART. A Story + Art = A Great Start! 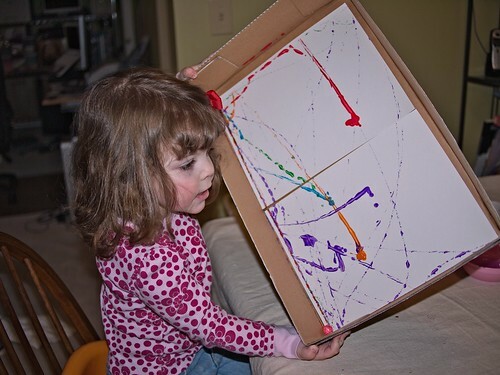 The idea for our craft came from this blog. Here's Molly's interpretation of Sarah, Percy and Bill. I presume all of you are familiar with the devastation from the earthquake in Haiti last week. Many of us have looked for ways that we can help with relief efforts (you've already seen Jen blog about Craft Hope). A bunch of indie Mac developers, including myself, have decided to respond by donating all of their sales revenue today to relief efforts. 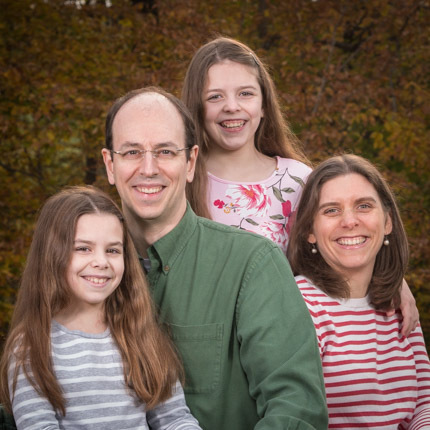 You can read more about the effort at Indie+Relief, and more about my part at my company blog. If you're a Mac user, I highly recommend considering purchasing some of these great applications and helping the relief efforts in the process. So, you are probably thinking, what happened to C? Well, I decided not to go in alphabetical order. Some weeks I have chosen a letter based on a holiday or specific scheduled activity, and other weeks it is totally random. 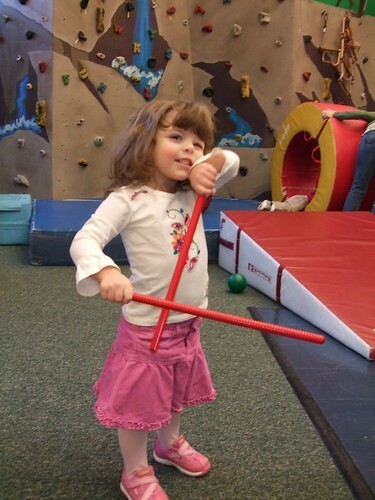 To begin our M week, Molly and I went to the "Music and Movement" class at our gym. We have been going for a while, but this week I actually documented it. Molly loves to sing, so we hear the songs from this class often! 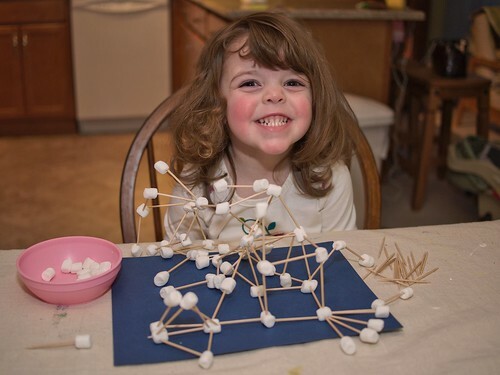 Later that day, we worked on crafting our letter M.
To work on fine motor skills, Molly built a marshmallow tower. I found the idea here. She kept asking if she could eat the marshmallows. The tower became a little less stable once the answer became yes. We did a little marble painting. 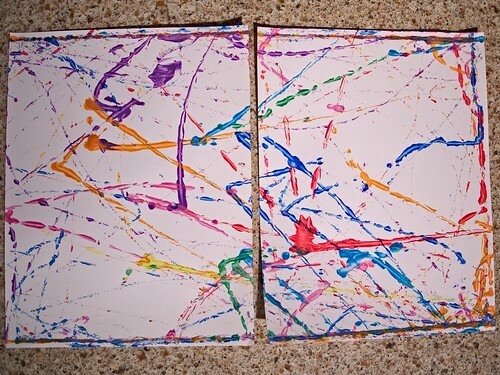 The marbles were dipped in paint and then we rolled them around the paper in box tops. 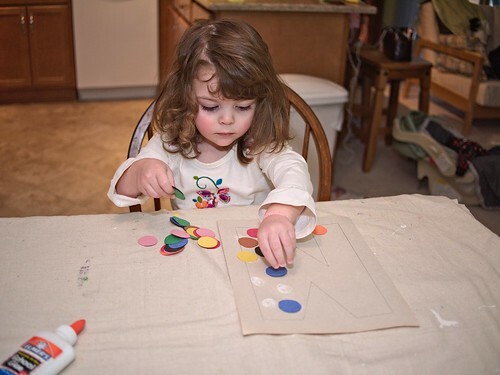 Michelle at A Mommy's Adventures came up with a great concept to extend a story. A Story + Art = A Great stART! 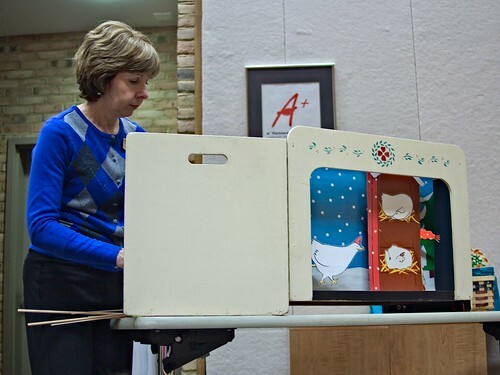 So, this week we participated via Storybook Friends at our local library. 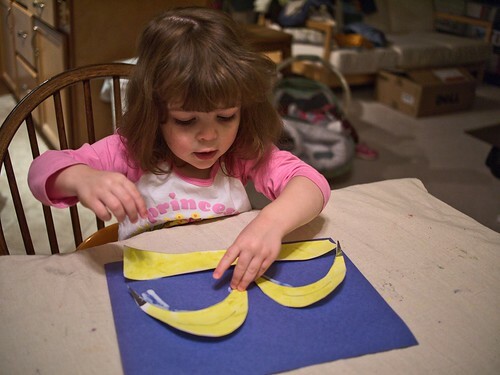 We heard a reading of A Hat for Minerva Louise by way of a puppet show, and then did a craft. 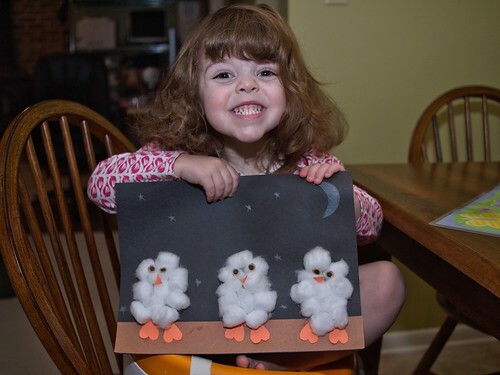 Molly had a lot of fun putting her hand prints on the mittens and gluing on snow flakes. 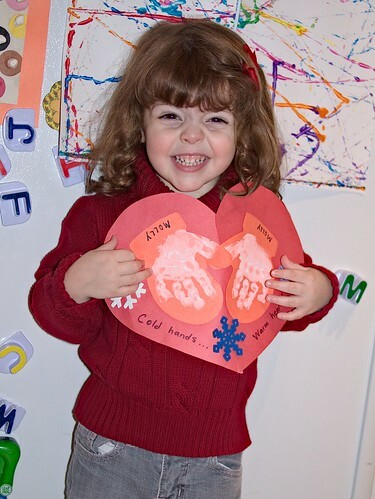 The phrase on the heart is "Cold hands...Warm heart." 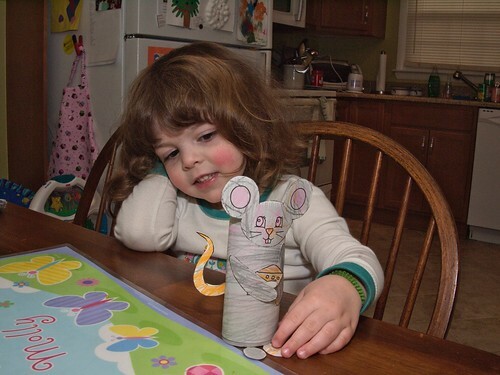 Our last project for the week was creating a mouse from this template. Molly has enjoyed playing with the mouse. She's even asked to take him to bed and for a ride in the car. 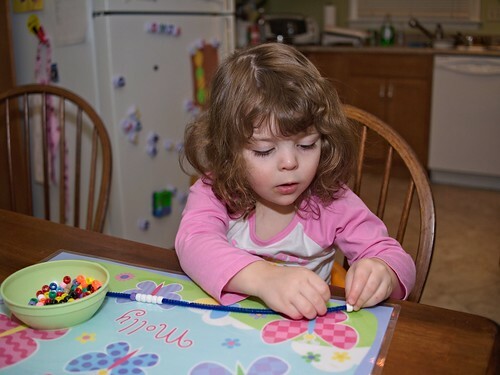 After coloring her mouse, Molly asked to color more, so I printed a letter M from this website. 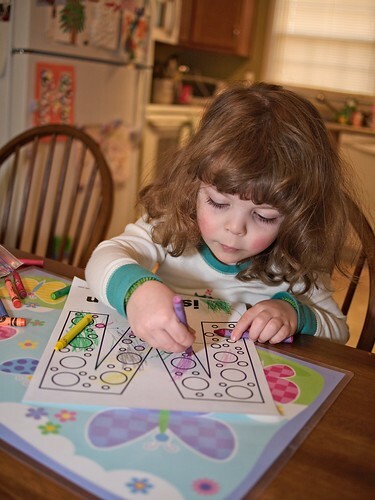 She's getting better at her coloring. 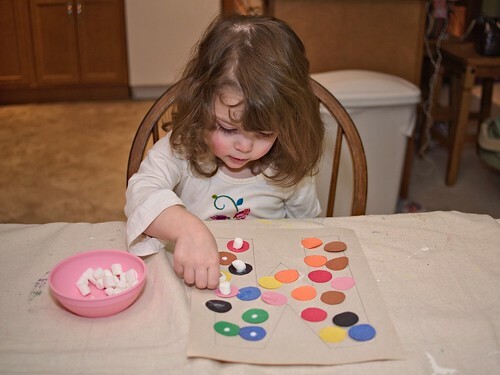 She was coloring the circles different colors, not quite in the line, but a definite improvement! We also watched Mulan a few times. Molly has enjoyed watching full-length movies lately, and we only have a few that are appropriate for her, so Mulan was new. So, that was our M week. 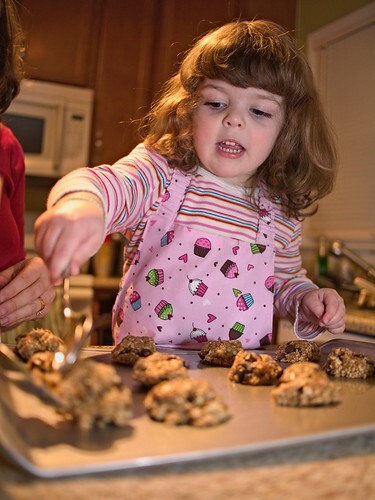 You can check out what other moms are doing with their tots at 1+1+1=1. Leah rolled over for the first time a few weeks ago. She actually went from back to front, which is usually the second way kids go. Ever since, we've been trying to get it on video, but Leah has not been cooperating. This video shows some of the trials in rolling over (and getting it on video). Note that all of this video was shot after she had started rolling over. Last week, I found Craft Hope. It's a faith-based organization that takes donations of handmade crafts to share with various charities. They have collected pillowcase dresses, dolls, baby blankets, sock monkeys, quilts, and their current project is The Red Scarf project. I am not a knitter, so I was sad that I couldn't help out immediately. Well, now I found a way to help! In the wake of the earthquake in Haita, Craft Hope set up an Etsy store to raise funds for Doctors without Borders. 100% of the sale goes to the charity. There is no restriction on what you can donate, so I donated one of my Little One Originals onesies. If you are the crafty type and want to help out too, here's how to donate through Craft Hope, or you can go buy something handmade in their Etsy shop. 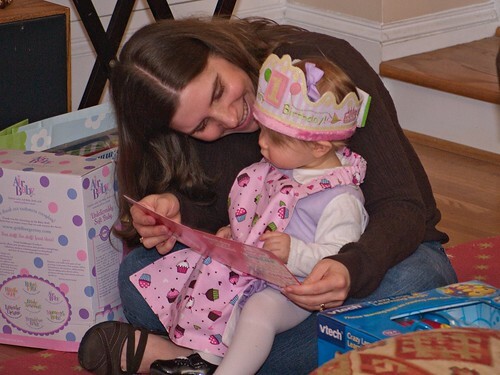 I was inspired by Melanie to begin working with Molly on preschool-type activities. I have decided to focus on a different letter each week. The letter this week was B. 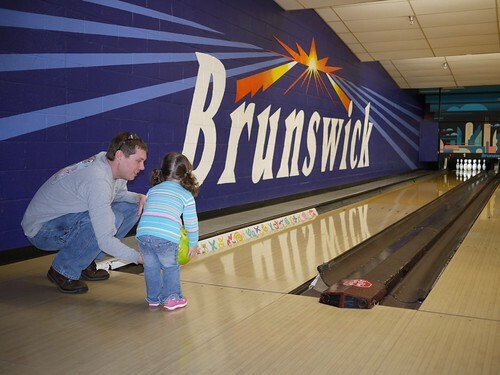 We began our week by going bowling with some friends. You can read the details of our fun here. 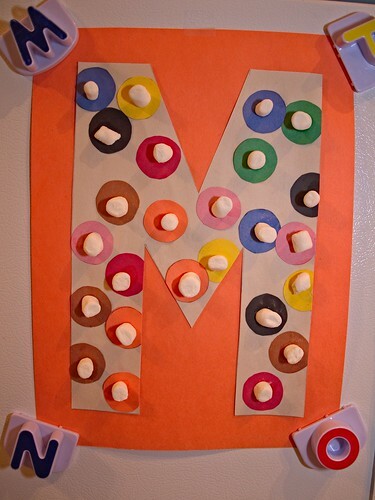 I based our letter craft off this site. 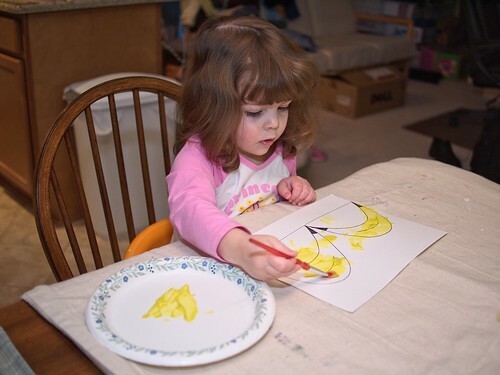 We started by first painting some bananas. 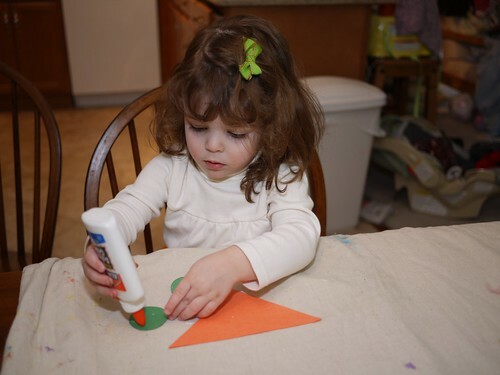 Then we cut them out and glued them on to construction paper. 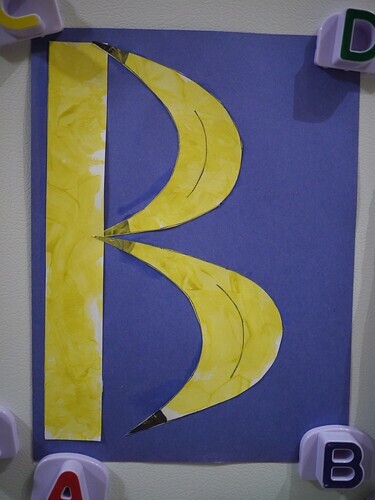 Here's our B for banana! Our final activity was baking banana bread. Molly was so excited to help and wear her new apron. First we mashed the bananas. 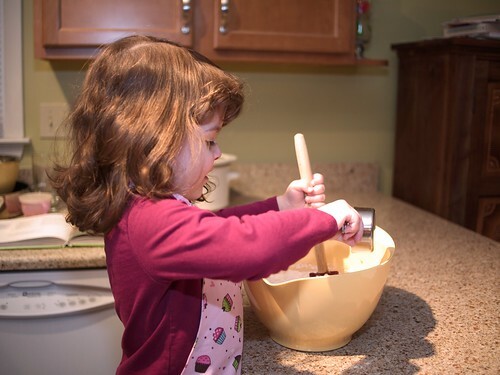 Then it was on to pouring, mixing and baking. 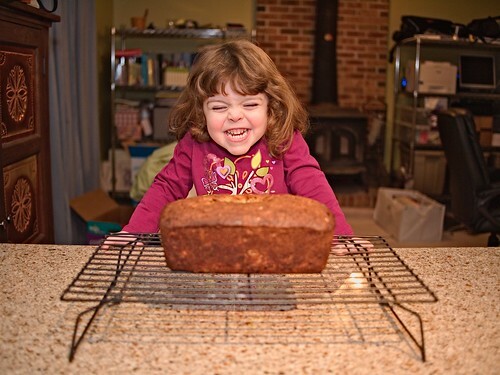 Molly was so proud of her banana bread. She had to show everyone that came over. 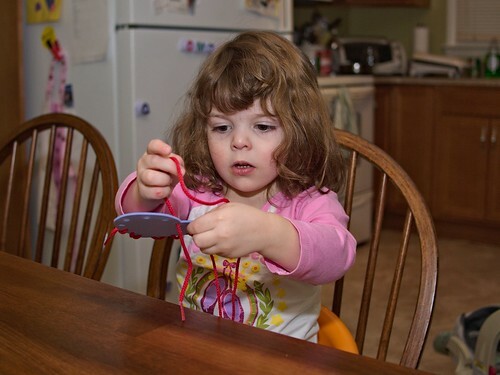 In addition to these activities, Molly also played with lots of balloons and some blue Play-Doh. I've had fun planning out our letter activities. I hope that I can keep it up and that Molly has fun learning as we go! 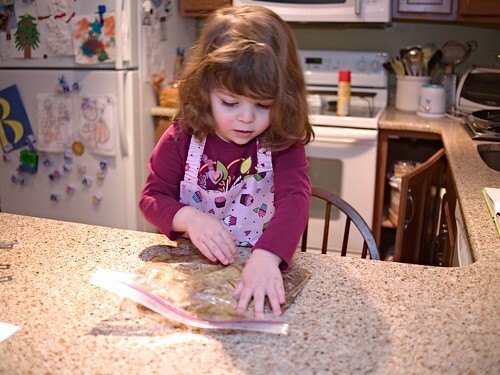 You can check out what other moms are doing with their tots at 1+1+1=1.